Together with your legs, you'll also want to bring your arms into play. A basic but very useful grip is to get a really deep grasp of the collar: you may find it helps to sit up to get that in really deep. As Roy Dean discusses in Brown Belt Requirements, an especially deep grip can help your choke as well as give you authoritative control. Once you have it, that provides three main advantages. Firstly, this gives you great control, as you can pull them down towards you. Second, it could be the beginning of a choke, and perhaps more importantly, it will make them start to worry about that choke rather than thinking about passing. Scully suggests grabbing their same side collar with both of your hands, then pulling down hard. You can then move into the deep grip. Scully also emphasises the importance of connecting your elbow to them as soon as possible, as well as cutting your arm into their neck. If you can combine it with a cross-sleeve grip, even better, as then you may be able to pass their arm across your body, perfect for armbars and back takes. Finally, consider adding in overhooks and underhooks, especially in nogi. If you can reach your same side hand under their armpit and around their back, you can lock it to your other hand to clamp in tight on the shoulder. That presents you with opportunities for pressing armbars and omoplatas, or butterfly sweeps if you move into open guard from there. Teaching Notes: I've had issues with closed guard for a long time now, so I was looking forward to getting to this month, as that means I can really focus in and try to explore why I have those issues. I'm also keen to make these lessons immediately useful. A number of times I've wondered if it helps have a whole lesson on grips and posture, but for the moment I'm going to persevere. Watching a Jason Scully video about closed guard concepts (from The Grapplers Guide, one of the earliest online instructional sites and still going strong), I was reminded of how jnp's control point framework could apply to all positions. Normally I think about it mainly as a side control and mount thing, but looking at what Scully was showing, I can see it as a closed guard thing too. In the video, Scully talks about posture control and head control, familiar to most people, but also emphasises arm control. He talks about angles too, something I was trying to do more last time we did closed guard month. From a control point perspective, adding in that arm control as a key detail would seem to fit with the primary control triangle of the head and shoulders. Previously I've been focusing a lot on the head, which is helpful, but leaves the shoulders free. Adding in underhooks and overhooks enables you to start getting the shoulder control points too. Like one of the Artemis BJJ students said a while ago, the shoulder clamp grip is kinda like the 'superhold' from on top of side control. Same idea, get control of the head and the shoulder if possible. I didn't talk about this as much as I wanted to: as often happens with the grips and posture lesson, it didn't feel as cohesive as I wanted. I did remember to talk about what Scully calls 'active legs', getting them up higher on the back rather than just flopping on their hips. Hopefully that means you rely less on arm strength: I often end up with a sore right arm after playing guard, as I clearly rely on it too much. It particularly gets sore right above the elbow, which must be where I'm tensing too much when holding somebody in guard. There's also the importance of continuously attacking, which in the context of this lesson would be going after their posture. I was also trying to keep in mind what submissions would be ideal to flow into: the deep Relson choke makes sense, perhaps the sit-up sweep sequence too. 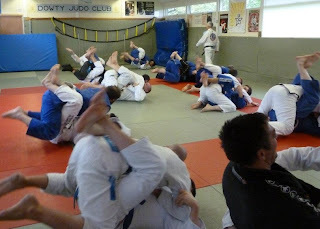 I think I'll go with the sit-up sweep on Wednesday, with a kimura on Friday, then onto the classic armbar-triangle-omoplata series next week. I could show a lot of grips in this lesson, but stuck to the deep collar grip (adding Scully's suggestion, similar to Will, about grabbing the same side collar with both hands to pull them down), then the shoulder clamp. That seemed to fit well with flaring their elbows out and pulling them in. Though I am wondering if perhaps I should merge aspects of this lesson into other lessons on attacks. E.g., break the posture, shoulder clamp, pressing armbar. That might be too much though. Another option would be turning the posture breaking elements into a warm-up drill. I tried that in this lesson, with pulling in the knees as they try to raise up. I think I could do more on that, maybe even sprinkle the whole of the posture and grips lesson through the warm ups this month. Something I'll play with over the rest of June.